Just as daytime television is no longer primarily defined by its soap operas, the Daytime Emmys are also expanding this year to cover the whole morning and afternoon menu. 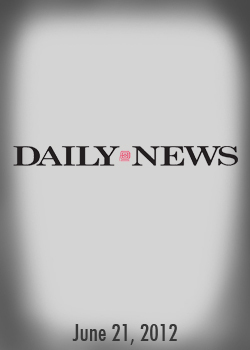 The 39th annual Daytime Emmys, to air live Saturday at 8 p.m. on HLN, will honor not just the soaps and their stars, but news shows, talk shows, food shows, lifestyle shows, children’s shows and legal shows. Numerically, dramas still dominate the awards. “General Hospital” has 23 nominations, the most of any show, and two canceled soaps, “All My Children” and “One Life to Live,” have 11 apiece. But ABC’s 56 total nominations are only five more than PBS, which is the home of no soaps. That means viewers Saturday night are likely to have favorites and predictions even in nonsoap categories, which plays into the primary pastime of all awards-show watchers: predicting winners and then either cheering or lamenting the results. That pastime is greatly enhanced these days, notes Headline News executive vice president and general manager Scot Safon, by Twitter, Facebook and the Internet. While HLN was a latecomer to this year’s Daytime Emmys telecast, signing on just days before Saturday’s ceremony, Safon says the network is thrilled to be here. 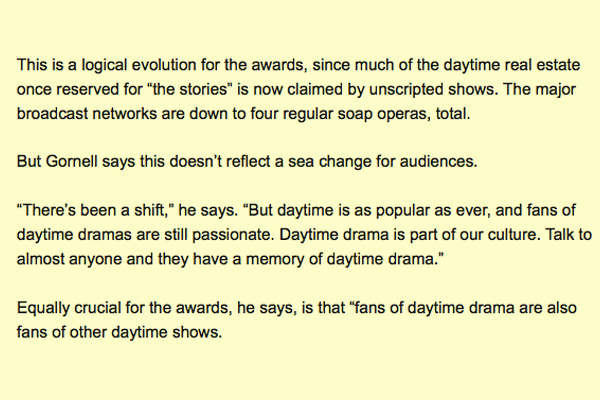 Gornell stresses that while they are broader-based this year, the awards remain a central showcase for daytime drama.